Well, it still doesn’t seem real yet, but tomorrow I fly to Australia!!! If all goes as hoped, I won’t be back in the US until late spring. It’s pretty exciting to think about such and extended amount of time spent traveling and hiking, and what the next 7 months could bring….SEVEN MONTHS! I still can’t wrap my brain around that! I know this summer’s high routes were a change for the journal, so thanks for sticking through all that. We are now going to be back to actual trails and I’m excited to write about something other than which rocky pass I climbed for hours multiple times a post. Believe me, I know that was repetitive, but I write what happens and that’s what filled my days this summer. Don’t get me wrong, I enjoyed those routes and am quite proud of doing such challenging terrain, but I don’t like writing “trip report” types of posts. I like the experiences and stories that happen along long trails and bringing those to all of you. It’s been a blur of back-to-back hikes this summer, and it was nice to get time away from blogging this past week. After the Wonderland Trail, I had a few days at home in Portland to get things organized for the upcoming international hikes, and then I took my annual trip to the Chicago area to visit my twin sister, three nephews, and many immediate and extended family members. It was great to spend time with everyone knowing how long I’ll be gone. Those that have followed the blog from the beginning know that my twin had her first son on my first hike, the Pacific Crest Trail. Her second son was born while I was on the Continental Divide Trail. Then last year, I planned the Great Divide Trail to be completed just in time for me to make it for the birth of nephew #3. Looking at them, it’s just crazy how quickly time passes. Here they are in their birthday shirts. All born in August, and I get to make it for the big birthday party each year Labor Day weekend. #3 is just walking…time to get them on the trails! 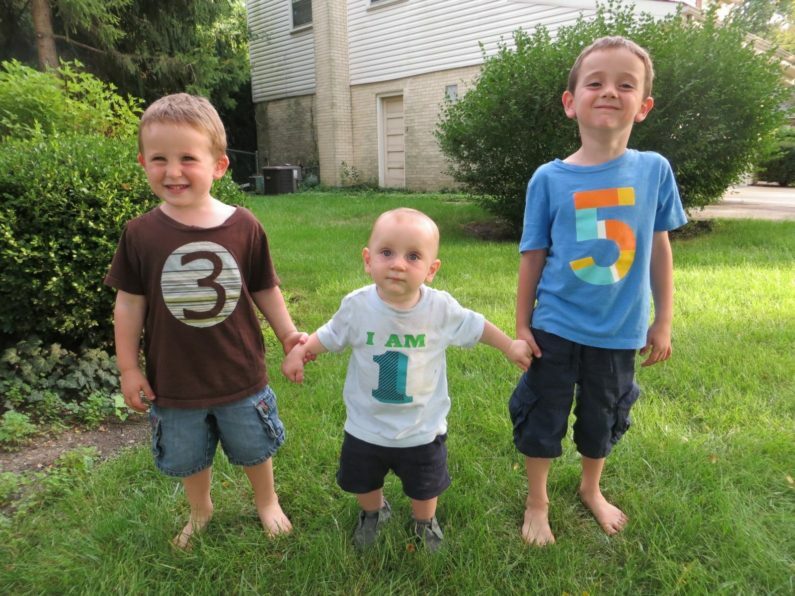 My nephews in their birthday shirts. So freakin’ cute! I’m currently writing this on my late night flight back to Portland, where I’ll have a day and a half to tie up all the loose ends and get final preparations together. All the major things like visas, flights, general hike itinerary, guidebooks, and maps are done. I just need to tighten up some things on the blog, TRIPLE CHECK THAT I HAVE ALL MY GEAR, and load up podcasts, audiobooks, and shows I am quite excited to delve into. With the routes I did this summer, they required much more attention and focus, so I didn’t find myself ever in the mood for anything other than music I could zone out with. In fact, with my working 60-70hr wks much of this past year, I didn’t listen to much at all and often found myself needing silent recharging time. I think I’ll surely start out that way in Australia as I still feel a great need to recharge and just walk mindlessly on my own for awhile. Speaking of going on my own, I’ll be doing all these hikes in Australia and New Zealand solo. There will be plenty of other hikers out there, with traffic similar to the popular US trails. So, no worries, I won’t be totally alone. Just alone enough to be free to do my own routine and schedule. The past two years, I’ve teamed up with people for those more challenging and remote hikes, and that requires compromises by all in their natural routine. I’m greatly craving some extended solo hiking and seriously can’t express how excited I am to do my own thing. I know it seems simple, but it’s pretty amazing to be completely independent and do everything based solely on my own gut feeling. I’ve missed that feeling of being in my own natural groove and greatly look forward to returning to that space. What will I be doing in Australia? An overview of my planned Australia hikes. I have three main hikes planned for Australia. First, I will fly into Alice Springs, in remote central Australia for the first hike. Before that hike, I’ve signed up for my first ever overnight tour bus experience that will take me to Uluru-Kata Tjuta National Park and Kings Canyon. Two of the more remote, yet highly recommended spots to visit in Australia. From Kings Canyon, I will somehow find transportation to the start of the Larapinta Trail (139mi) that will take about a week and I’ll hike right back to Alice Springs. As a comparison, the Larapinta is more like a tame version of the Hayduke hike I did in Southwestern US last summer. Although a remote and a shorter trail, it’s garnered quite a bit of acclaim for it’s unique scenery and beautiful landscapes. 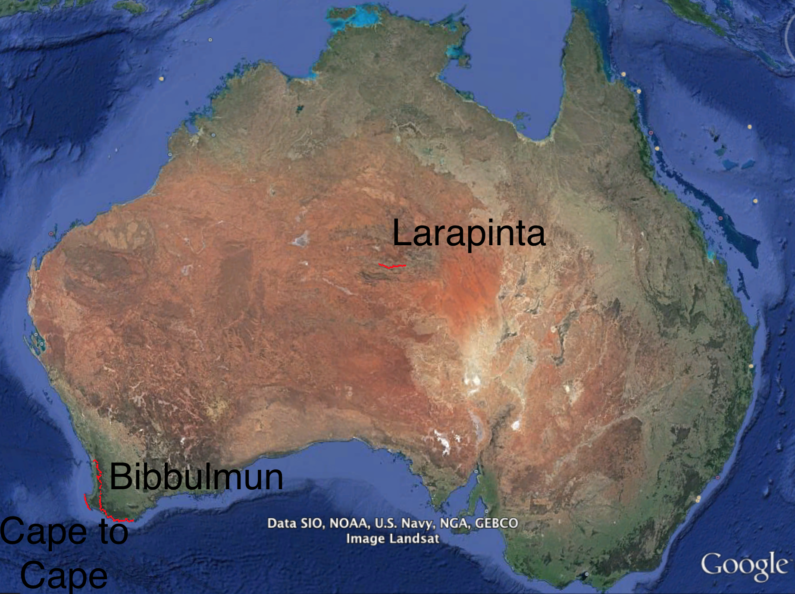 After the Larapinta, I’ll fly to Perth on the west coast of Australia to do the Bibbulmun Track (623mi) for a month where wildflowers should be in full bloom. This is Australia’s most known long hike. I’m not expecting anything that will knock my socks off, but I am looking forward to just walking and recharging on a trail that will be fairly mindless in comparison to what I’ve been doing and where I will be headed. It will be a great break! From the Bibbulmun, I’ll do another hike along the west coast call the Cape-to-Cape Track(84mi). It should take a handful of days to do and will be a beautiful ocean coast hike! That is how I’ll spend my 1.5 months in Australia. Yes, there are tons else to do in that massive country, but the main goal on this trip is to do the TeAraroa for 4-5 months in New Zealand, and I just wanted to do some trails in Australia while I was over there. I may find a way to hit Sydney (on the east coast) for a day since I’ve never been. I’m really hoping to return to Australia to hike in Tasmania (island on the south coast) after the TeAraroa if the timing of the seasons works out. Fingers crossed on that one as Tasmania is beautiful and dreamy! Finally, in November I’ll be starting the TeAraroa in New Zealand. I’ll give more details on this as the time approaches, but it’s sure to be quite a trip. I will be hiking the 1200mi TA southbound the full length of both islands of New Zealand. The trail doesn’t always hit all the highlights of NZ, so I will also be jumping off to hit some side trips along the way if timing and weather cooperates. I’m probably most excited on this one that it’s an open ended timeframe. Most hikes I’ve done have required some kind of timeframe due to other things I’m doing or an impending fall/winter season. I should have plenty of time to fully explore New Zealand on an unplanned schedule and not feel rushed. So that’s the update for now. There are tons more details I could write on the planning, logistics, and details of the trip, but I know they will come to the forefront naturally as things occur, so I’ll address all them as they happen. The next post will be sent from AUSTRALIA BABY!!! I’ve never commented before, but I wanted to de-lurk to say that I’m originally from Perth and I’m super looking forward to reading your reports from the Bib Track and Cape to Cape! I’ve only ever hiked short-ish sections of them so it will be cool to follow the whole trails vicariously and see my old “back yard” through someone else’s view point 🙂 Also very jealous that you’re doing the Larapinta, that part of Australia is beautiful. Oh so wonderful! It’s such an amazingly small world how many people have told them they are either from or currently live where I’ll be heading. Oh thanks so much David. Wow, you’re doing what I hope to do at 80! EEEEEE!!!! How exciting!!! MR even told me that you were heading to Australia soon. Have a great trip!!! Oh how sweet! Right when I left yesterday, we showed it to Lucas and Aidan on their globe and Lucas was really absorbing it. I have relived so many many miles through you. Now I get to experience the Southern Hemisphere! Be safe and be happy! Kathryn and I are so exciting about your next epic adventure. Can’t wait to hear all about it. I didn’t know you were from Chicago. What part of town/high school did you attend? I was born in Oak Park, grew up in LaGrange/Western Springs and attended Lyons Township HS. We’re going to see Rockin’ and Dan tomorrow night in Mammoth so we’ll say hello. Oh cool! I actually spent my 20s in Chicago after college at U of I Champaign. I was raised in Carbondale in Southern Illinois. My sister moved to the suburbs (Deerfield) last summer and it’s a pretty great spot to raise a family. My dad and uncle went there before I was born, of course.. waaaayyy before you were, of course. What? And you’re a fellow Illini too? This gets better and better. What did you study? I graduated in architecture, spent the summer and moved to SoCal in the fall. That was only 42 years ago! At least you got out of C’dale before you became a Saluki like Jim Belushi. Thanks Corinna! Oh I really think Tassie could be quite the fitting and grand finale to all of this! Safe travels and soft landings.. onward to great hiking! Have a perfect time down under! Perfect! What a way to kick things off!!! Oh, boy! I will be reading about your hiking adventures while I travel Australia and NZ in a more cushy and conventional fashion, mid-Nov. to mid-Dec. Wouldn’t it be a minor miracle if we ran into each other? My family and I picked up your hiking partner, Katherine Cook, on the road to Hanksville, Utah while you were doing the Hay duke trail last year, so we didn’t get to meet you. Good luck on your adventure down under! Thank you Bill! I will contact you. I’ve removed your email for privacy. Stoked that you are on your way to see dinky-di Oz. Have a bonzer and ripper time hiking and hopefully, at this time of year, you won’t have to give the ‘Aussie salute’ too often. Hopefully things won’t get misplaced down under, but if they do, just say ‘they have gone walkabout. I’m looking forward to all the ‘yarns’ of this adventure. Been following you since the PCT and can’t believe all the ground you’ve covered since then. Sure am glad I found your blog and so happy to be along for the next seven months. You’ve worked hard for this; I hope you enjoy such an extended time off. And thanks for continuing to include family in your posts. It is so cool to see how it all fits together. -Your posts always brighten my day! It seems it wouldn’t be complete without Warren around! Wired! I’ve only followed you just this last summer and enjoyed your tales of trails! I’m excited for you and am looking forward to hearing about your next adventure! Erin!!! You know how I am– please be careful 🙂 !! Enjoy your wonderful adventure and keep the posts coming. Love you, P.
Australia is an amazing place to visit and I’m sure you’ll have a great trip. Tasmania is well worth the visit. I walked the Overland Track in 1996 and it was truly fantastic – unlike anything I’d every hiked before. It reminded me of a warmer and drier Scotland; better still it lacked midges, although it did feature brown snakes. I never did get over the novelty of waking up in the morning and seeing wallabies hopping past, but I could have done without possum hassle! Thanks Tricky. I really do hope I get to the Overland Track for the finale! I hope to get Down Under someday (need to at least visit my son Sydney’s namesake! lol) and also to walk in “Middle Earth”. Curious if you replaced your compass for the Southern hemi or if you’ll just be relying on GPS the few times you may need to find where you are? Erin, I’m so delighted that you’ll be in our lives sharing your epic, gorgeous adventures for months to come, our wonderful, endless year of Wired continuing. And of course thrilled for you to have this extended, hard-won piece of time on your own – hopefully at a more relaxed pace with time to chill on the trail, soak it all up, meet the Aussies and..Kiwis? Far freaking out. I’ve been following along since you were planning the PCT with your friend who was unable to go with you. What an amazing, miles-long journey you’ve been on. Thank you so much for bringing us along. You’ve added something special to my life which, very sadly, includes no trails but a whole lot of yearning to be out in it all. Your glorious pics take turns on my desktop. I wish you well Down Under, so far away but back ON the beaten track, hooray. p.s. So fun to see the darling Aug b’day boys in a row in their seriously awesome tees. I grew up in HP so I know just where your gang is now, more or less. Oh great Tay! I love it when I hear from people that have been there all those years from the very beginning. Yes, it’s been quite the ride! Since I’m the total opposite of wired-capable (find it tricky to even successfully end a call on my phone, or mistakenly end one when I’m just trying to swipe thru contacts – I was never able to manage a comment on your old platform, or the original setup, way back when. I did try, several times, and for whatever reason “it” didn’t work, lol. This is the 1st it time it occurred to me to try again. I was seriously stunned when my (sorry!) novelette length note popped up. p.s. Have relied on and adored my Sansa Clip+ for years! Love that can be paused/volume adjusted in pocket or clipped anywhere, no stopping to fiddle, no eyes required. What time did your flight arrive in Portland? We might have crossed paths as my wife and I just spent a week on the Oregon Coast and flew out of Portland at 6 pm on the 8th. Would have been great seeing you in person. Anyways, you have a great adventure in New Zealand and everywhere else. Looking forward to it. It was close, but my flight arrived around 11:15pm! Have a great trip! Can’t wait to follow along, of course! Good luck on your travels Down Under and in the Land of the Long White Cloud! I love the long white clouds!!! Always great to have people along who have been there since the start. That’s so cool! The series keeps getting renewed for a new season!